Yasuhiro Wada is a true hero of the games industry. For years now he's been crafting the most beautiful, charming, innocent games, from Harvest Moon through to last year's delightful Birthdays: The Beginning. Wada's aesthetic avoids violence for pastoral peace and his games promote harmony and sustainability. So whenever Wada-san is attached to a project, we're immediately keen on it. Little Dragon's Cafe is his latest project. It's going to be localised by Aksys, and it's already sounding wonderful to us. The story opens with a twin brother and sister learning to cook and manage a small café under their mother's tutelage. All was peaceful and routine until one morning when the twins discover that their mother has fallen into a deep sleep and won't wake up. Suddenly, a strange old man appears to inform them that they must raise a dragon in order to save her. 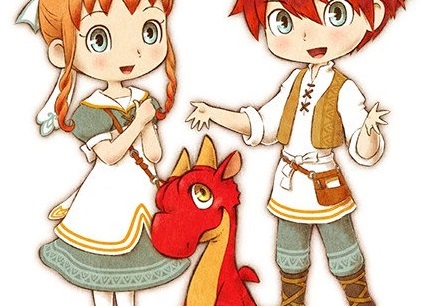 Working together with three quirky café employees, the two siblings must figure out how to a wrangle a dragon and manage the family business while finding a way to save their mother. Dragon Husbandry - Embrace your parental instincts and raise your very own dragon! Through wise decisions, proper nutrition, and empathetic nurturing show the world the true potential of your dragon companion! Culinary Capitalism - Learn new recipes and master the art of cooking while running your very own café. Explore the world, discover new ingredients, and expand your menu (and your restaurant) while catering to the whims of your customers. Grow Your Own - The tastiest dishes use the freshest ingredients, and the best way to insure that is to grow your own produce. Till the land and fish the rivers to gather the most flavorful fixings for your signature dishes. Serve the People - Feeding is nurturing, so you not only cook for your neighbors, but also help them with their problems to increase your popularity and the general happiness of everyone around you. Sounds good, right? You won't have to wait long for it; it releases on Nintendo Switch and PlayStation 4 in Summer (Winter for those of us in the southern hemisphere).